2018 Mercury Marine® Fourstroke 150 HPStronger. Lighter. More Durable.Massive displacement and the lightest 150 hp four-stroke in its classSmarter. Lighter. More durable. Class-leading power that has set the boating world on fire.FourStroke technology and Mercury. Always moving forward. With boater-driven innovations and technologies. Like electronic fuel injection. On-board digital monitoring that protects your engine. And a total commitment to corrosion protection utilizing hard-coat anodizing and a superior multi-step paint process. Mercury FourStroke engines have consistently set the bar for clean, quiet performance and low fuel consumption. Plus, no one has more models to fit your needs.Features may include:Performance, Durability, Efficiency.Making 150 horsepower is easy for this 3.0-liter, four-cylinder, single-overhead-cam engine. Its generous displacement lets it churn out power without breaking a sweat. You get exceptional durability and long-term peace of mind.Calculate your fuel savingsThe Mercury Fuel Savings Calculator will allow you to easily calculate the possible fuel savings of a Mercury FourStroke outboard!Choose how you use your boat, select the TwoStroke and FourStroke horsepower - and our tool will show your potential fuel savings. If you're looking to upgrade or add more power, you can even choose different FourStroke and TwoStroke horsepower options!Compact and Versatile.It’s the lightest 150hp four-stroke outboard on the market. Smart design makes the 150hp Mercury FourStroke nearly 20 pounds lighter than its closest four-stroke competitor, and less than a battery weight heavier than a two-stroke. Potential uses for this engine are endless, including bay boats, boats with poling platforms and pontoons with swim platforms.Propped to Perform.The Mercury Enertia® propeller is the perfect complement to the 150 FourStroke. Designed specifically for large four-stroke outboards with a revolutionary low-diameter/high-blade-area design and cast with the Mercury proprietary X7® propeller alloy, Enertia delivers phenomenal acceleration, top speed and durability.Easy to Maintain.Rather do it yourself? The no-spill oil-change system, an easy-access fuel filter and a lifetime maintenance-free valve train make the Mercury 150 FourStroke the easiest-to-maintain 150hp four-stroke on the market. 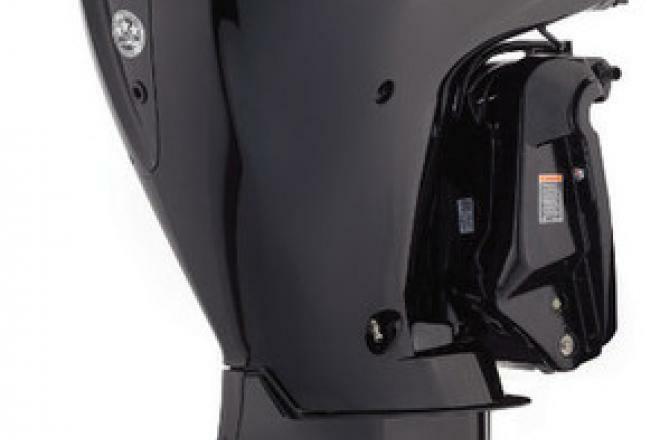 Scan a QR code under the cowl to link with step-by-step video demonstrations.Perfect for Repower.The compact, lightweight design of the Mercury® 150hp FourStroke engine fits most transoms, including those with narrow engine wells and tight motor spacing. Rig it with mechanical or hydraulic steering, mechanical control and cable systems, and a full complement of analog or SmartCraft® gauges.